Au Fil du Jardin: Sewing! When I woke up this morning, I was full of energy: It is our National Day in France, so I'm not working, besides I did sleep (it is so hot that I can't go to bed at night, and wake up early most days. Yesterday I was exhausted, went to bed early and slept until 6 this morning, I was soooo pleased). Anyway, what was I going to do? The appliqueds dolls were tempting. On the other hand, I need some dresses for summer. I found this pattern . It looked easy and quick. It was indeed. Only a few seams, no darts, only two pieces to trace, wondeful. Le buste est ample avec un beau tombé couture façon bénitier sous les bras, la taille est coulissée élastique et le bas de forme crayon, long sous le genou, lui confère beaucoup d'allure. Sorry folks, I don't have the translation...I sounds very good in French. 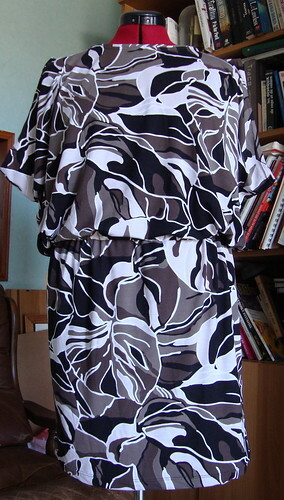 Very few seams: a dress with some character, without the trouble to sew it. The other good feature of this pattern is that it requires a double-needle. I tried double-needles on strecth twice, but the results were not good at all and left me frustrated. In the meantime, I had purchased a stretch double-needle and double-checked the documentation of my machine. Surprise, there is a special setting for double-needles... And this morning, it was a pleasure to work with it. From now on, there will be more double-needle finishing on my clothes! Happy Batille Day.Nothing like a day off to get you revved up to do a project. This dress is great. I love the pattern. I am also glad for you that you figured out how to use the double needles. Your choice of fabric here is perfect. Love it!